We put travelers on the fast track to a beautiful Baltimore adventure. Our grand, 202-room boutique hotel, located in the historic B&O Railroad Headquarters near the Inner Harbor, mingles its storied past with a vibrant present. 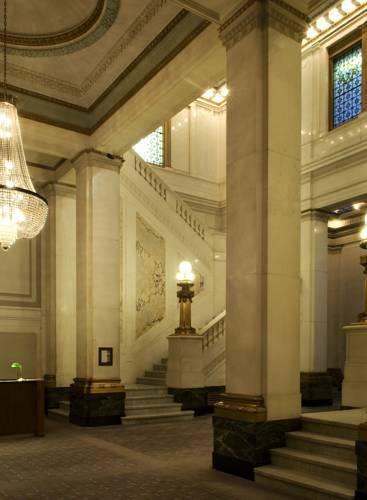 From the second you enter our 1906 Beaux-Arts building, you'll be dazzled by fine details like soaring marble staircases, crystal chandeliers, and Tiffany stained glass windows. Yet pops of whimsy and Kimpton personality define welcoming spaces, too from luxurious guestrooms to local hot spot B&O American Brasserie. Athens: Athens North & South: Located on the lobby level. Room can hold up to 200 people and is a great space to host meetings, receptions, & weddings. Surrounded by large 8ft windows. Room can be divided by an air wall into separate 1,386 ft & 726 ft spaces. Caracas: The Caracas room is 726 sq ft, perfect for meetings/events up to 50 people. The space is conveniently located on the hotel lobby level. The room is surrounded by large 8ft windows allowing for tons of natural light. Paris Ballroom: The Paris Ballroom 2,970 sq ft is located exclusively on the 3rd floor with sunny 8 ft windows that allow for natural light and can accommodate up to 190 people for meetings, events & weddings. The ballroom is also attached to a usable 2,307 sq ft foyer. Tokyo Boardroom: The Tokyo boardroom is 416 sq ft and can accommodate 12 people comfortably. Surrounded by sunny 8ft windows it is conveniently located on the lobby level and is perfect for smaller meetings. It is also large enough to allow space for food and beverage. Vienna: Vienna North & South: Located on the lobby level. Room can hold up to 200 and is a great space to host meetings, receptions, & weddings. Surrounded by large 8ft windows. Room can be divided by an air wall into separate 1,386 ft & 726 ft spaces. Baltimore Convention CenterThe Baltimore Convention Center is a convention and exhibition hall located in downtown Baltimore, Maryland. The Center is a municipal building owned and operated by the City of Baltimore. Johns Hopkins UniversityThe Johns Hopkins University is an American private research university in Baltimore, Maryland. Founded in 1876, the university was named for its first benefactor, the American entrepreneur, abolitionist, and philanthropist Johns Hopkins.